The featured questions function as a sort of shortcut / favorite to an answer in Q&A. What is cool is that you can actually add your own. To do this start Q&A and come up with the question you would like to feature. I used “medal count by country in europe for swimming vs athletics”. 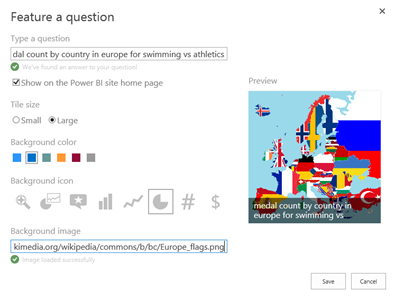 Now, copy that question (or remember it) and click on the fly-out on the right and then choose “featured questions”. Next click on “add featured question”. In the next window type or paste your question and wait for Q&A to validate it.